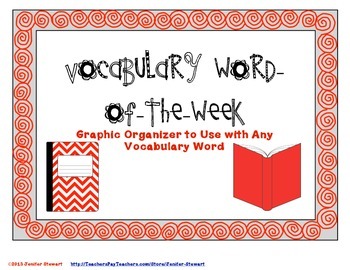 This is a graphic organizer designed for use with any vocabulary word or vocabulary program. 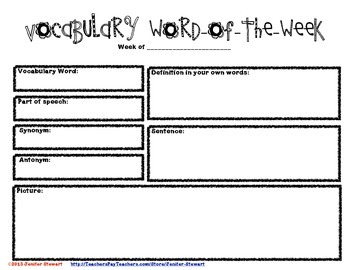 I use the "Vocabulary Word-of-the-Week" program, but this could easily be used to teach domain-specific vocabulary across the curriculum. 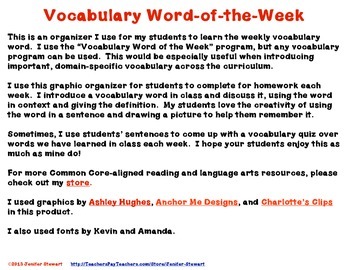 I introduce the vocabulary word in class each week. We discuss the word, and I will use the word in a sentence. Student's will complete this organizer for homework. My fourth and fifth grade reading students love the creativity of coming up with their own sentences and pictures to help them remember the definitions. I will even use some student-created sentences when I make vocabulary quizzes. I hope your students enjoy this resource as much as mine have!